After reading my friend's blog on the year we just left, I was inspired to take some time to reflect on my own journey of 2011. It was quite a year. January: Fresh off the trip to India with As Our Own, my head and heart were still spinning. I had fallen in love with beautiful little girls who had been rescued from human trafficking. I came back ready to live beyond myself, to make decisions about my life as though I were a parent, making decisions to give these girls a better life. I would have gotten on a plane and moved to India to be with them in a heartbeat. I still would. I would easily give up my life here to be with my girls. But, for now, that is not what God is doing, so it has been a year of missing my girls, of letting myself slip into living for myself and then beating myself up for even beginning to slightly forget them. And, learning to have grace for my forgetting, for my living while still challenging myself to make sacrifices for my girls. February: Ready more than ever for a new season of life, I applied for a girls' ministry job in...wait for it...Lubbock,TX. I had sworn to never move to the Panhandle of Texas, despite having awesome family there. I was sure the flatness of the land would kill me. 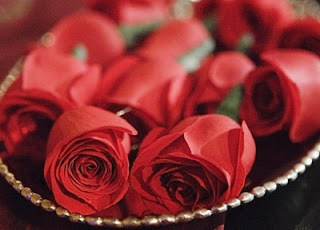 But, I decided that the "what" of my life was far more important that the "where" as far as my happiness was concerned. This job seemed like the perfect fit. The interview process was awesome and I was excited about the possibility. Meanwhile, I met with Amanda to tell her about my trip to India. And as we talked, she handed my a little envelope and told me about a church plant that her family was starting. She invited me to be a part. I was excited about that as well. I was torn. My heart could easily go all into the vision of this new church. But my heart also longed for a job that fit. So, I decided to let the Lord decide. If I got the job, I'd take it and if not, disappointment would be scarce because I was already in love with this new church plant. Turns out that, for now, Lubbock was not home and while, it did sting a little to be rejected (and rather abrubtly-probably because I'd asked the Lord to be really clear), I woke up the next morning thrilled that I could go all in with Bayou City Fellowship. March: I finally decided to start writing out the "Choose Me" series that had been floating in my head. Admittedly, I have not kept up with it as much as I would have liked, but it is started. It is out there. It is stirring. April through July: I have tried to think of something exciting that happened during these months. I just, cannot remember anything but feeling stuck. I just felt trapped and was wrestling with God a LOT during this season. It was a hard hard few months. Harder than it had been before. I didn't know where God was. My whole life: emotionally, spiritually, physically, relationally...it all felt like chaos. Everything was swirling around me, mocking me. So. much. wrestling. August: I auditioned for The Voice on my 28th birthday. It was a fun day. I didn't make it past the first round, but I felt good about my audition and spending a day hanging out with random people who love music was far more exciting than sitting in an office entering data. The staff of the show were all very kind and encouraging. It was done really well. 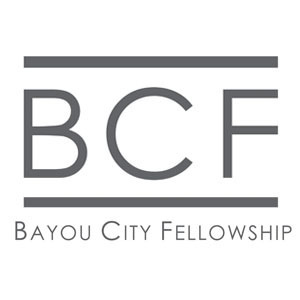 September: Bayou City Fellowship opened it's doors. 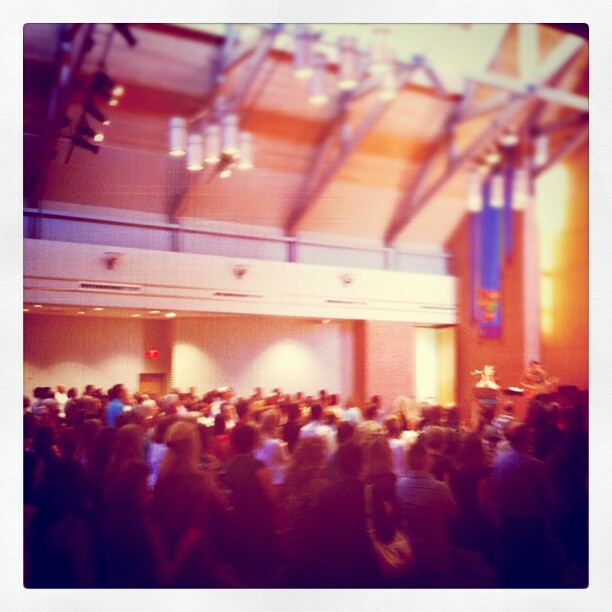 We had almost 500 people on our first Sunday. We were blown away. And you know what? Most of those people have stuck around. We have seen God do amazing, God-sized things. We could not have done what He has done. It's awesome. I love my church. I love my community group and the youth. I love the worship team and the worshippers in the congregation. I love worshipping with and living life with families: little children and young married couples and grandparents. I love love love it. October: Catalyst. 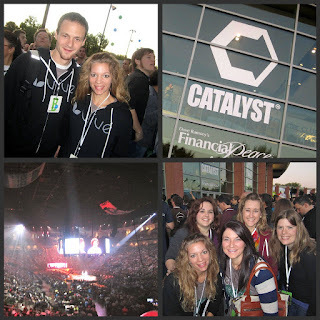 I went to the Catalyst conference with my best friend and some other really awesome friends. I was overwhelmed by the fire hydrant teaching but much of it stuck. The biggest of which was "Do Not Fear. Daddy is going with you." (Mark Driscoll). I would say the theme of the conference for me was "It's time to step out of the boat." I had felt that it was time for me to leave my job even though I didn't not have a job to go to. I needed to hear confirmation. And I sure did. Everything from "the right people need to be in the right seats on the right bus" to "give God first fruits even when you don't know where second fruits are going to come from" to practically every song that Aaron Keyes led us in. "Your plans are still to prosper. You have not forgotten us." Then I came home, told my dad I was quitting my job. Went to work that monday and turned in my 2 weeks' notice. On my last Monday of work, after talking with HR, I had a freak out. "What am I thinking?! I don't have income. I don't have enough savings. I don't even have a lead on a job!!!" But, that night, I came home to an email from a friend who said she had seen this job listing and thought it sounded perfect for me. And it did sound perfect! I immediately sent my resume. They called and we scheduled an interview for the next Monday, my first day of being unemployed. The interview was great. They asked me to come for a second interview Tuesday. After that interview they said, "Can you start tomorrow?" *Gasp* Yall. I was unemployed for 2 days. That is it. 2 days! There was no gap in pay. There was no wondering how I would pay rent the next month. God said go. And I said "But but but..." And he said, "But what? Do you trust me?" So I tentatively stepped out of the boat and lo and behold...I am in a job that I love. I work with kids. I teach them about Jesus. I lead worship. I get to learn about parenting and discipline and patience. I get Christmas off and Summers...granted, unpaid, but still. Seriously. God is far more kind than I deserve to give me such a wonderful, fulfilling job. November: On top of giving me an awesome job. God was beginning to open doors. Lots of them. I led worship for a girls retreat. And let me just tell you, everything in me wanted to say no to that opportunity because I felt...feel...inadequate. Inexperienced. Not. Good. Enough. But I said yes. And I told God I would not say no to any opportunity to play and sing. (That is freaky by the way). So, I led worship and it was the absolute best weekend. My heart was so full leaving that weekend. I got to hang out with the junior and senior girls and yall, they were amazing. 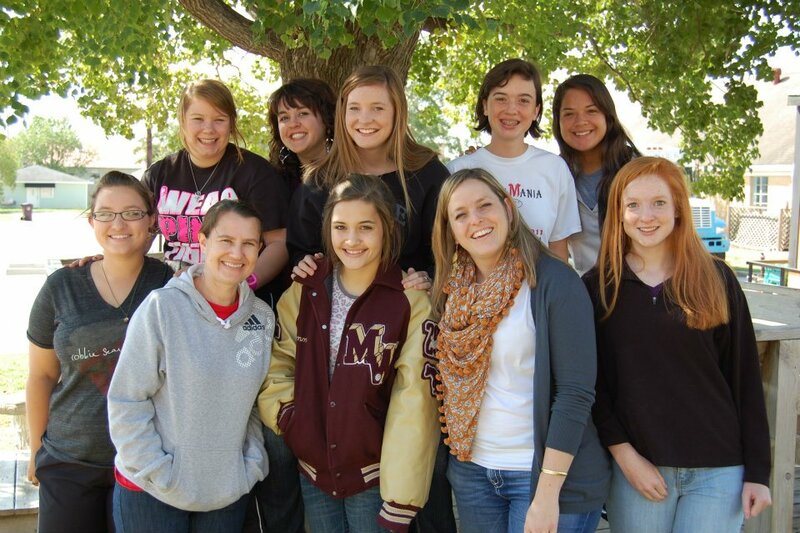 I miss girls' ministry. I also went to a faithwalking retreat in Novemeber. I went as a cynic. I don't trust highly emotional processes that promise to bring change. There are a few reasons for that, but that's irrelevant. I wanted to be changed. I wanted to hear from God but I just didn't trust that I would. Well, I was wrong. A big part of the process was uncovering the vows we'd made through life. (for example: I will never fail again. I will always be in control. No one will ever hurt me again....) The way you uncover those vows is by listening a lot to the Lord. I don't "hear" from the Lord often in that way....sitting and listening for Him is hard because I justify away the things that come to mind. What if that was just my own thought, not God's? But I listened. And He showed up. He uncovered all sorts of little vows. But the overwhelming theme of them? "I am not enough." I believe(d) that. And now, is the hard work of fighting through that. It's not enough to recognize it. The Lord wants to change it. But I have to change how I think. And so, when I want to say no to things because I do not feel adequate, I have to start saying yes. When I want to run because I think I'm not enough, I have to stay. It's hard, but it's good. Decemeber: Oh December. I prayed and watched as a team of friends went to India to be with my girls. I was so excited for them, but ached for wanting to go with them. I woke up most of the mornings they were gone thinking of India. I thought about the girls and Ralph who had birthdays in December and the wonderful celebration we had last year. I thought of the 1/2 marathon that I will be running for them, of how hard it will be and frustrating for this non-runner as I train. And I thought of how much these girls are worth my discomfort. I celebrated the season of advent by teaching my kids at work about the history of scripture and how it all is about Jesus. I marveled that it had been only 2 months since I started that job and how I could love those kids so much even though I hadn't know them long. I cried somedays because they didn't listen well. I hurt over the times I had to discipline them. I smiled somedays at their funny comments and the way they heard some things I'd say. I hugged kids who cried. I laughed with them in silliness. I somehow got them to eat their vegetables (once). I helped with math homework(a miracle). I played more shows in December too. 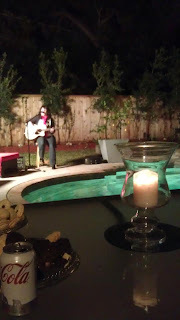 Backyard concerts. They were so much fun. 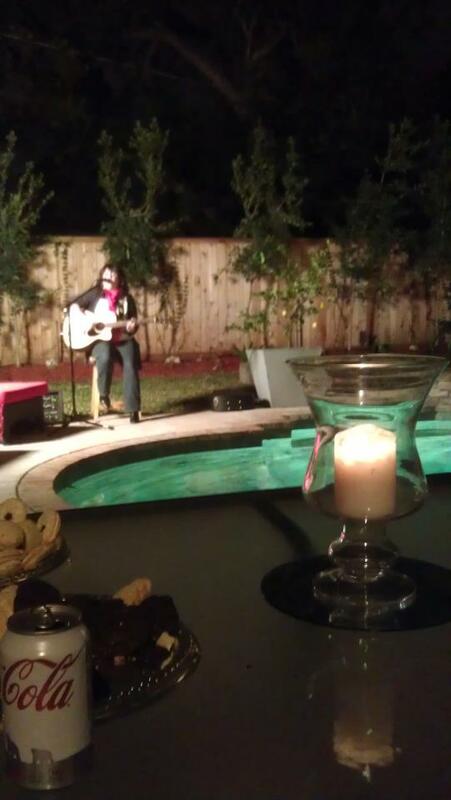 And I got asked to play at HEB in January. I cannot wait. The Lord provides. Sometimes it's through 3 years of a less than perfect job. But sometimes, it is through perfectly placed blessings. I am glad to be in a season of the latter. So, 2011, you were quite a year. So much growth. So many lessons. So many songs. So many tears. And ending in so much more laughter. So much more peace. So much more hope. As I told a friend tonight, I believe that 2012 will be a year that requires a lot of hard work. It will take effort, discipline, perseverance. But, it will be a rewarding year. A year of results. A year of fruit. I am excited. And I saw a verse on Pinterest the other day and immediately knew that it was for me, for this next year. i'm so glad you shared the recap of this year in your life and encouragement through how faithful God truly is! I think 2011 was huge for everyone. I haven't talked to a single person who hasn't been completely awed by what the Lord has done in the past 12 months. These next, I'm confident, will be just as joyfully overwhelming. I'm excited for how the Lord is moving and using you, Erin.